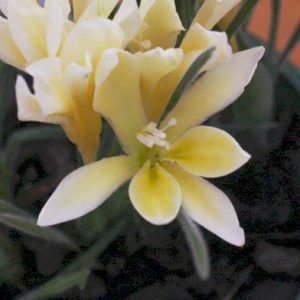 A spring flowing bulb that are easy to grow, Babiana are easy care and with attractive flowers and good green foliage make a great addition to a sunny position in the garden. These tough little bulbs are also suited to growing in pots or containers. Babiana stricta and B. angustifolia are the best known species of these generally hardy bulbs that do not need to be lifted every year. They are readily available for sale online from February to March each year. Rare species such as Babiana vanzyliae (pictured right) are occasionally available from specialist growers. Also known as Baboon Flowers are a late flowering spring bulb with long lasting blooms. With purple, blue and pink flowers resembling those of the Freesia, Babiana are a native of South Africa and prefer full sun and a well drained soil. When planting remember that these bulbs do like a dry summer, so plant in an area where this can be achieved. In pots and containers, use a free draining potting mix, the bulbs are best planted at around 15 cm deep. In general, the bulbs should be planted at around 15 cm apart, however, if you are prepared to repot each year, you can plant Babiana bulbs at 5 cm apart for a dense display of flowers. Plant them en mass in the border for a great display of color.